On a daily and weekly basis we receive emails, comments and questions readers all over the world who want to have a deeper understanding of Bible prophecy in the end times in which we live. They ask great questions on the Pretribulation Rapture, the Kingdom of God verses the Kingdom of Heaven, Eternal Security and so many other things in the Bible that takes patience, study and the leading of the Holy Spirit to understand. And we love answering your questions! So much so that the Lord has lead us to create a brand new radio channel on how to “rightly divide” your Bible. CLICK IMAGE TO VISIT OUR NEW RADIO CHANNEL AND FOLLOW US! 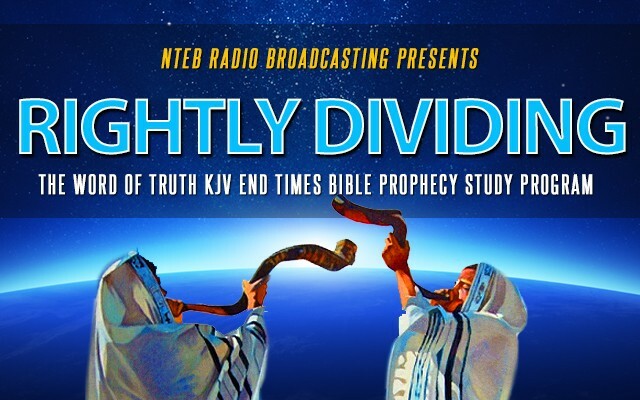 Our new Bible study program, Rightly Dividing, will be on Sunday evenings from 9:00 – 11:00PM EST, and all shows will be recorded and available in the NTEB Teaching Archive so you can access the information whenever you like. Our very first program will air Sunday, October 4th, 2015, and we invite you to come join us. We have a very timely topic to talk about, especially in the light of all the current events taking place in Syria this week so far. This week, as Russia launched airstrikes in Syria and Iran is sending in ground troops, a study of the two wars mentioned in the book of Ezekiel is very timely study material. The 38th and 39th chapters of the prophet Ezekiel is an area where many students of prophecy get hopelessly tangled up because though they have a lot of commonalities, they also differ in many key aspects which prove they cannot be talking about the same war. It’s two different wars, separated by a minimum of 1,000 years. Let’s take a look and see what we find. We hope you will grab your KJV Bible, fire up the coffee pot, and tune in and be a part of our first radio broadcast on Rightly Dividing. Our new program will have a live chat room and a call-in number for you to ask any question you have about the Bible and have it answered live.